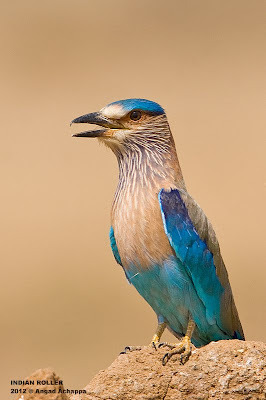 This lovely bird below is the Indian Roller. 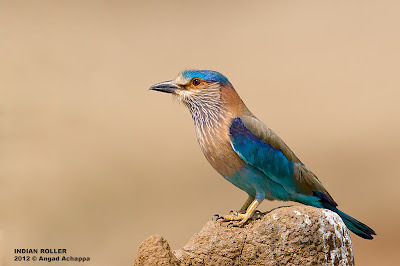 It also happens to be the state bird of Karnataka. The Indian Roller gets its name because of the 'rolling' display of the male during breeding season. They have a huge variety when it comes to prey ranging from small insects such as crickets , grasshoppers, bees, etc and larger prey such as lizards, scorpions, mice, etc. There has been a recent development at the grassland where these images have been photographed and if action is not taken, we may see the end of this particular habitat of theirs!! At first, the government planted saplings over here(half of which have already died), did they not realize the meaning of the term 'grassland', who plants a huge number of tree saplings in a grassland, and now the great minds at work here want to build a theme park or a film city at this very grassland. It is time THE SYSTEM changes, let us take a stand against this stupidity!! Click HERE to sign the online petition agains this nonsense!! Beautiful bird ! Also, very sad to hear that their habitats are in danger. This bird is very beautiful and looks a bit like the Lilac Breasted Roller we have in Africa! Pictures are simply gorgeous as always! That's very pretty bird and you have capture it very beautifully! Its interesting how the bird get its name. No wonder this gorgeous bird is a State Bird! I signed the petition. Hope this helps. Gee...Loss of Natural Habitat is a world-wide issue. I have my own fight going here...sigh. Splendid pictures Angad, and nonsense is everyhwere in this world! Amazing photographs, I like how the blue is blended into brown. A beautiful bird I've never seen, and probably wouldn't, hadn't I not landed on your blog. And thanks for enhancing my GK, not that it was good to begin with. Now I know our state bird. On a different note, why don't you move to WP? They are so beautifully colored! Amazing! Great pictures Angad. I have signed the petition and posted on my small facebook page. If the could in Britain they would concrete large chunks over. Brilliant job..!! Very informative and spectacular photography…!!! Spectacular shots, compliments to you !!! hi sir, spectacular shots.. myself srinivas from karnataka, Dharwad. i also want to be a wildlife photographer.. i love wild animals and raw nature.. please guide me out sir..